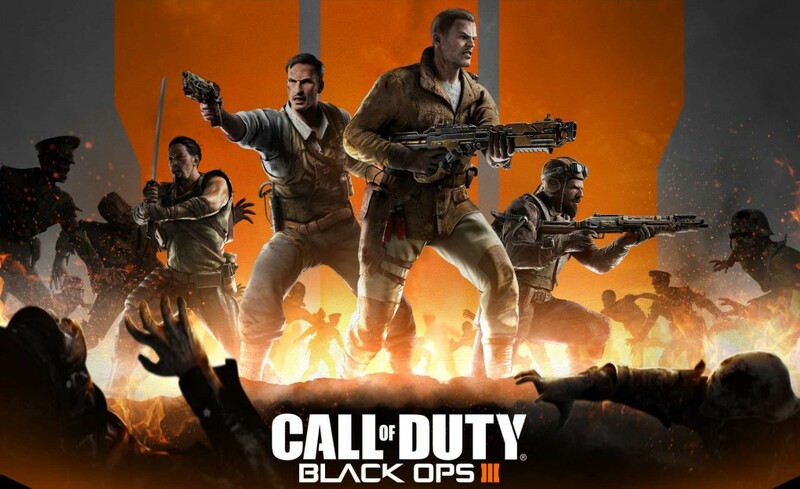 The sun sets on another Treyarch Call of Duty for a couple of years with the last instalment of Black Ops III DLC, and it seems that with Salvation the team could well have pulled it out of the bag with this final batch of multiplayer maps, and conclusion to the zombies story. Citadel was the first map I played on, and immediately I was struck by the colours. Lots of greens and reds in a medieval style fantasy location complete with castle, battering ram and even a Mage’s tower in the distance. Like the Berserk map from the previous DLC pack, Citadel is visually and thematically a really interesting place for a futuristic shooter. There is a moat around the castle and a drawbridge which made for some interesting surprise kills. And there is a nice mix of open killing grounds and more tightly-packed areas, particularly within the castle itself. Micro is perhaps the standout of the whole pack. It’s set on a picnic table within a back garden and for some reason everybody has been shrunk down to the size of ants. It has a real “Honey, I shrunk the kids” vibe with huge hot dog rolls, ketchup bottles and cans of beer strewn across the place. There are some nice touches with melting ice and bottles dumped in it to keep them cool, as well as sausages sizzling away on the BBQ – even ants crawling all over the cupcakes and other items. 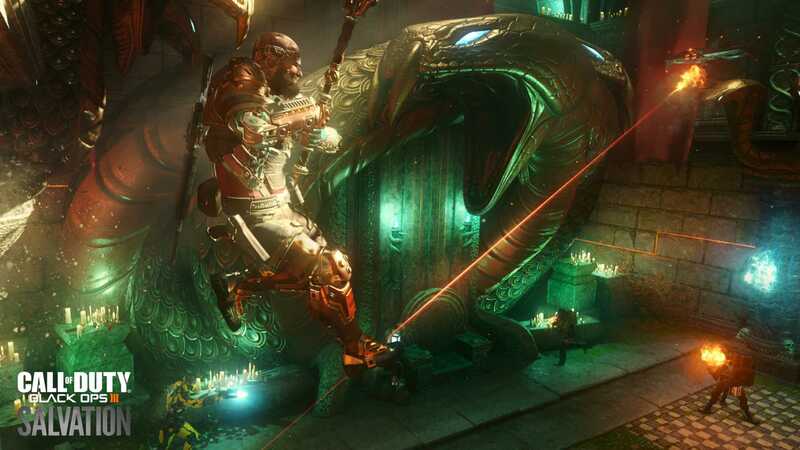 I really liked Micro, not least because it feels like a map that the development team just let themselves and their imaginations go to really come up with something novel and fun. 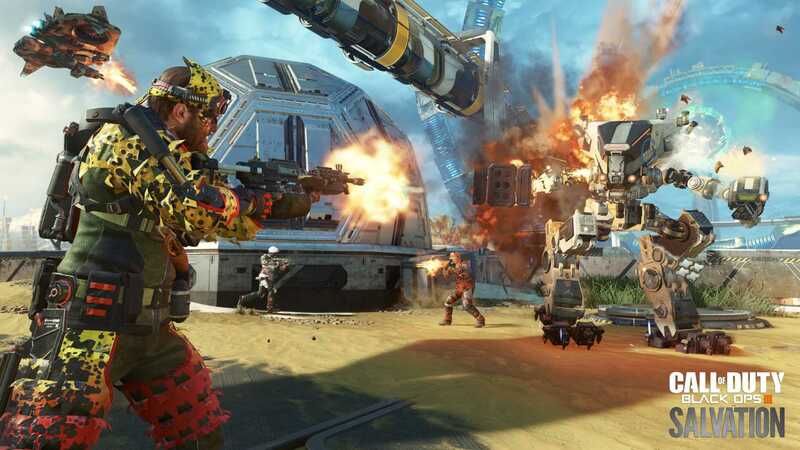 However, as it is a small map there are issues with poor spawn-points at present, with players spawning right in the line of sight of opponents. Outlaw is a re-imagining of the Black Ops II map, Standoff, and Treyarch have done a really nice job of re-skinning it to look like an Old West style town. Standoff was one of the best maps from Black Ops II and it really lends itself to the new movement style with lots of wall running and open areas. There doesn’t appear to be too much different to the original map, with the layout pretty much identical and all the same elevations as before. The back alley areas are all still in place and, with the added player elevation, make for some pretty frantic fights. The central area of the map is really nicely detailed, and there are some interesting touches that add an element of dynamism to the map during play, with a steam train roaring past at certain points. Rupture is another old Treyarch map, but this time from World at War. Built from the ground up, Rupture re-skins Outskirts from the eight-year-old game and renders it completely unrecognisable. One of my favourite maps from World at War, I really struggled to see any element of the base map. World at War had significantly larger maps than Black Ops III has in general, to account for times when tanks could be used and as such Rupture seems huge. Littered around the map are mechs that can be entered and utilised in battle, but they are very slow and surprisingly not fun to play with. The map itself is fairly open with some obvious chokepoints and high elevations to snipe from. Overall, Rupture feels like the weakest of the four new maps. Revelations is another solid Zombies map, seemingly managing to tie up the narrative for the original cast from World at War. As I have said in the last three pack reviews, I am not a huge Zombies player, but from what I have seen from this instalment is another strong entry with plenty of secrets and Easter eggs for those players heavily invested in the storyline to uncover. Salvation feels like a suitable conclusion to Black Ops III, and is the best DLC pack Treyarch have put out for this development cycle. Micro is lots of fun to look at and I like the feeling that the development team really let their imaginations run wild with a couple of the maps. Outlaw is a good remake of a favourite Black Ops II map and the Revelations map offers lots of surprises for fans of Zombies, nicely tying up the ongoing saga for the original cast. But overall, Salvation is the strongest of the four DLC packs and is a high note for Treyarch to go out on for this instalment of Call of Duty. Salvation is the strongest of the four DLC packs and is a high note for Treyarch to go out on for this instalment of Call of Duty.